The feeling of elation runners experience when crossing the finish line of a marathon can quickly be replaced by the sluggish, run-down feeling they endure in the hours and days following the event. The amount of stress put on the human body during a marathon often causes runners to come down with a post-race cold or sickness. However, the good news is that these illnesses can be avoided with a healthy, cautious recovery period after the race. While moderate exercise has been shown to improve the body's immunity to disease, periods of strenuous exercise lasting longer than 90 minutes can weaken the body's immune system. After about 90 minutes, depending on a runner's reseve of carbohydrate energy, the body uses up its natural energy supply of glucose, triggering the release of the stress molecule cortisol. Higher levels of cortisol, in turn, can weaken the immune system and make the body more susceptible to infection, "Marathon & Beyond" magazine explains, most commonly upper respiratory tract infections. Runners who compete in marathons in extreme weather conditions are at even greater risk for a weakened immune system. When a runner races through extreme cold or heat -- conditions unlike those in which he normally trains -- his body's core temperature can fluctuate according to the weather and he is at a higher risk for fever. A cool-down period of 10 to 15 minutes, spent jogging lightly or walking, will allow the body's core temperature to ease back into a normal range. After this brief cool-down, a runner should remove sweat-soaked clothes, which can cool the body's core temperature and create a chill after running, and drink plenty of cool -- but not ice-cold -- fluids. To allow the body's stress levels to return to normal after a marathon, a runner needs to take extra rest, both by getting a good night's sleep and with an occasional nap. One to two hours after the race -- once a runner has cooled down, drunk plenty of fluids and eaten a snack or small meal -- she should curl up for a well-deserved afternoon nap. 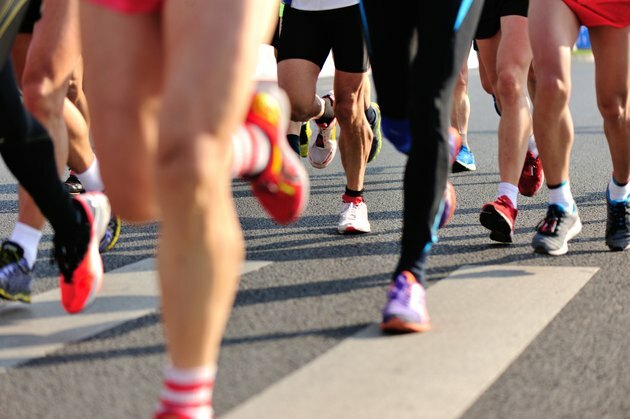 The body's immune system can remain suppressed for as long as three days following a marathon, so runners should also focus on getting at least eight hours' sleep in the days following a marathon and may even hit the snooze button guilt-free when the alarm clock rings the next day. After a marathon, a runner must replenish the supply of carbohydrate energy he used up during the hours spent on the course. While complex carbohydrates should make up about 60 percent of a runner's post-race diet, a runner can also boost his energy and consume valuable vitamins and minerals by eating plenty of fruits and vegetables. Green vegetables, beans and fruits provide rich sources of vitamins A, E and C, as well as iron and zinc, all of which can boost the body's immune system. Eating these natural vitamin sources during the days following a marathon can actually deliver a more nutrient-rich energy source to the body than vitamin and mineral supplements.